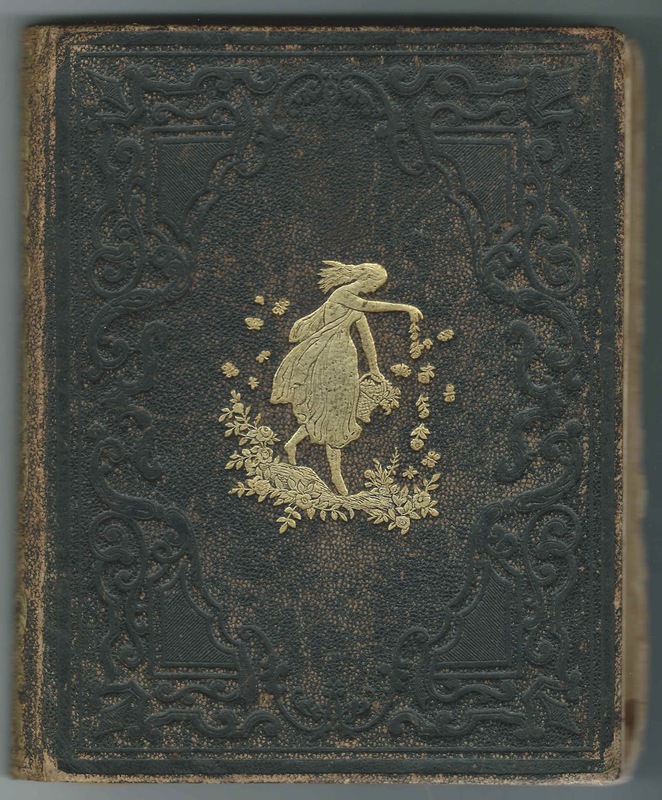 Album that was presented to Hattie in 1860, presumably Harriet Naomi (Burbank) Hunt from before and after her marriage to David Franklin Hunt. Most of the inscriptions are from the 1860s, the rest by daughter Florence C. Hunt in a later era. 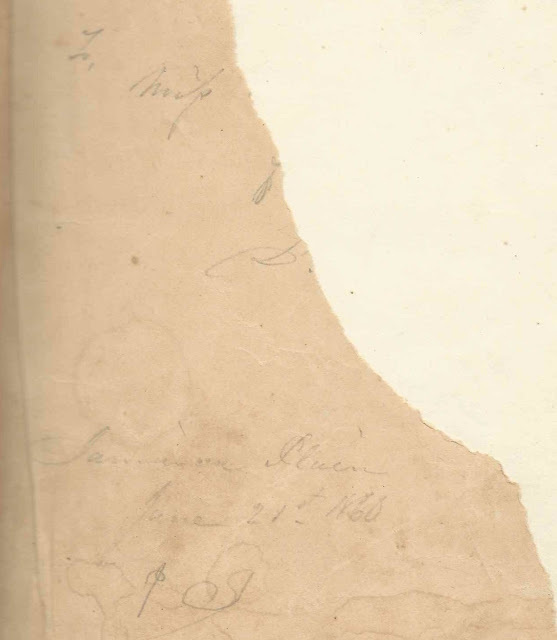 Sadly, the presentation page is half torn away and is missing the names of the person who presented the album to Hattie at Jamaica Plain, Massachusetts, on June 21, 1860 and Hattie's name, which might have included her full name. 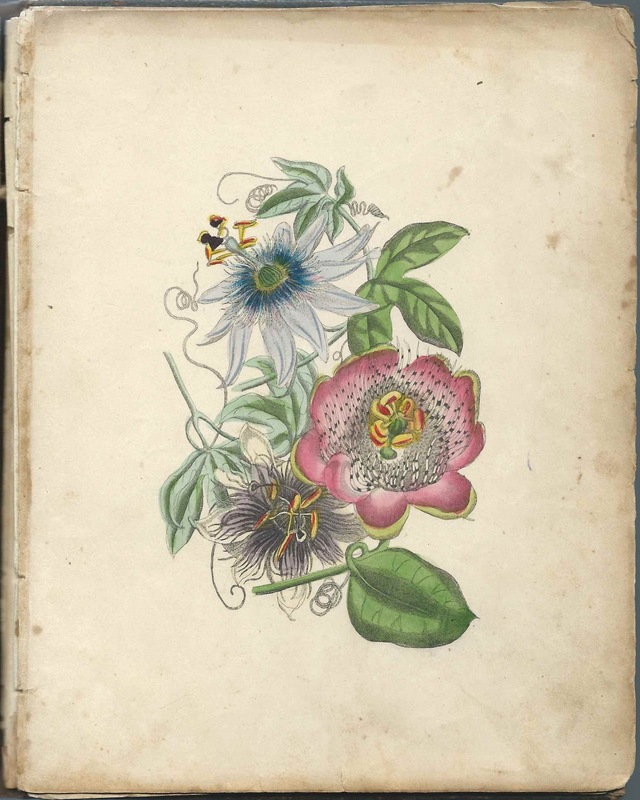 The album measures approximately 7-3/4" by 6-1/4" and contains the sentiments of about 20 of Hattie's relatives and friends, as well as five hand-colored botanical prints. The title page is missing, but the album may have been produced by J. C. Riker or another quality printer of the era. Assuming I have the correct Hattie, Harriet Naomi Burbank was born January 27, 1845 at Worcester, Massachusetts, the daughter of blacksmith David Burbank and Elizabeth (?) Burbank. Hattie's Massachusetts birth record does not provide the maiden name of her mother, unless her mother was also a Burbank. Hopefully a reader will weigh in. According to the History of the Town of Antrim, New Hampshire: From Its Earliest Settlement to June 27, 1877, with a Brief Genealogical Record of All the Antrim Families, by Warren Robert Cochrane and published by 1880 by Warren Steam Printing Press, Hattie married David Franklin Hunt, a native of Hancock, New Hampshire, in 1864. In 1868 they moved to Antrim, New Hampshire for a few years, left for a couple years and returned to Antrim in 1873. The 1910 Census shows David and Harriet at Sodus, New York, where David was manufacturing an apple processing machine. They were back at Antrim where David died in 1912. Hattie died in 1918. They're buried in the Maplewood Cemetery at Antrim, New Hampshire, along with daughter Florence Caroline (Hunt) Madden and husband Thomas Madden. They had at least two children, daughters Antoinette A. Hunt and Florence Caroline Hunt. As mentioned above, Florence inscribed three pages in the album, including one page with a sketch of a house, perhaps after the house where she grew up. If you have corrections and/or additions to the information above, or an alternate theory of Hattie's identity, please leave a comment or contact me directly. 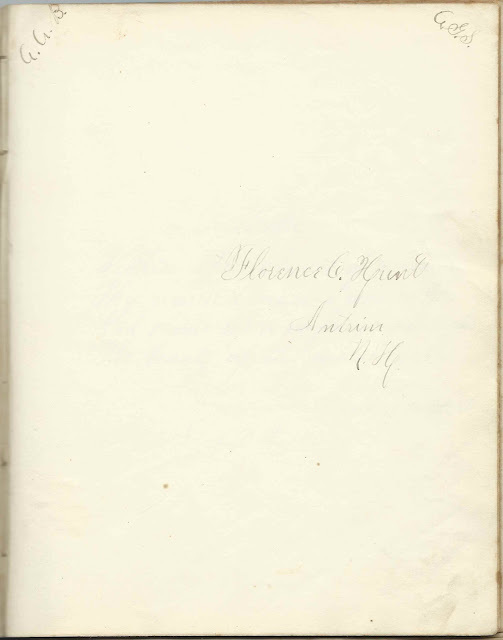 L. G. T.; not sure of last initial, could be Y. Inscribed at Jamaica Plain, Massachusetts, on November 25, 1862. Emma; inscribed on May 7, 1873. 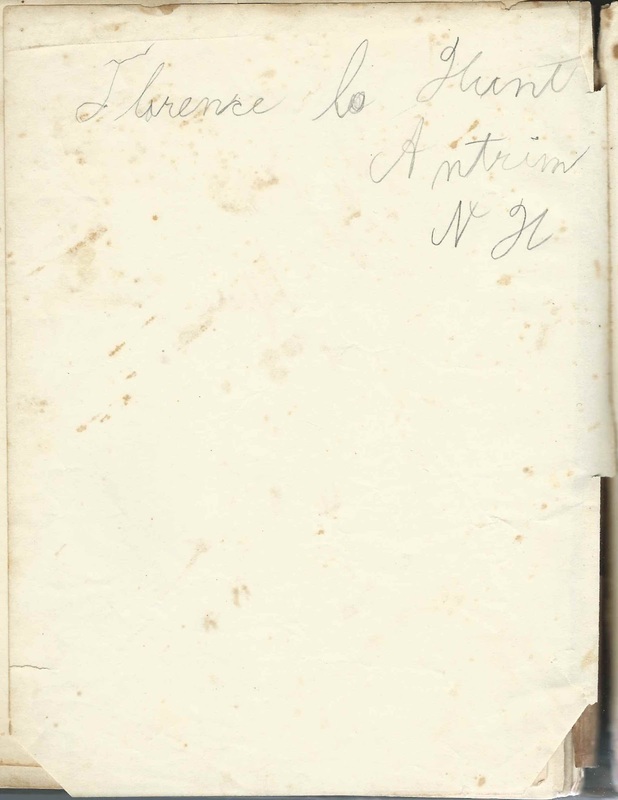 "Remember me when going to school at South Antrim"
D. F. H.; presumably David Franklin Hunt, who would become the husband of album owner Harriet Naomi (Burbank) Hunt. Florence C. Hunt of Antrim, New Hampshire; "A.A.B....A.G.S." She was the daughter of album owner Harriet Naomi (Burbank) Hunt, "Hattie", and David Franklin Hunt. 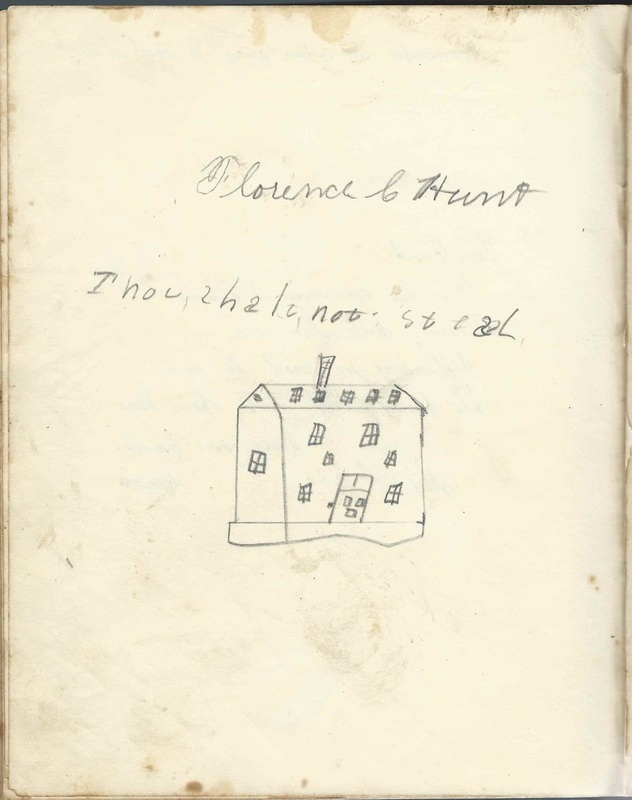 She inscribed three pages in all, including where she sketched a federal style house, perhaps the one where she grew up.